Dog Bite Prevention Starts With YOU! This week we have been talking about bite prevention and proper interaction with dogs. A high percentage of dogs bites to children are caused by inappropriate approach to a dog. The belief among animal behavior professionals is that the major cause of dog bites to humans is related to failure of owners and dog bite victims to recognize when dogs are fearful and know how to approach and greet dogs correctly. What is the appropriate approach and why do many people fail to do it? One issue is that humans have an instant gut reaction to the anything cute. It’s the same reaction we had as a child when we saw a cute teddy bear or other stuffed animal. As a result we treat pets as if they are cuddly toys. While many dogs are friendly, cute, and love interacting with humans, they are definitely not toys. In fact, when you think about it, dogs are a bit like humans in that the same types of inappropriate greetings that would cause a human to be afraid or irritated would cause a dog to become fearful and even aggressive too. You’d probably feel threatened if someone randomly walked up to your car and stuck their hand into the window to reach for you. Similarly dogs may feel scared or violated if you reach into their safe space. It’s best to stand out of the dog’s safety/ threat zone and even look away so it’s clear you’re not some bad guy trying to break in. People frequently see a cute pooch and want to rush up to pet him. Just as you might feel scared if a stranger or even an acquaintance ran right up to you, a dog may feel uncomfortable too. It’s best to approach slowly—at a leisurely walk while watching the dog for body language signs of fear. It’s mostly kids who rush up uncontrollably to pet a dog, but even adults encroach threateningly. For instance, suddenly reaching out from nowhere without first asking parents or the owner can lead to bad results. Even children are nervous of strangers approaching, and rightly so. We shouldn’t expect our dogs to be more comfortable with stranger danger than our kids. That’s why it’s important to always ask owners if it’s OK to greet their pets. It’s up to the owner to know their pet well enough they can inform others if it’s safe to pet their dog and if the dog will enjoy the interaction. Starting in childhood, we were all told to avoid staring. It’s rude, and even creepy. So even if a dog’s owner says it’s OK to greet Rover, avoid approaching head-on and staring. Instead, approach offset or sideways and look using your peripheral vision. Have you ever seen a toddler or young child visiting Disneyland or some other theme park to see their favorite beloved cartoon character? But when they see Mickey Mouse or Yogi Bear he’s gigantic in size and looming over them and they get scared. The same thing happens to dogs. They may seem friendly and happy as you approach, but if you loom over them, especially if you’re facing them head on, you can cause them to have a meltdown. That’s why it’s better to stand facing slightly sideways and remain outside their personal space or bubble. Note that the size of the bubble varies from dog to dog. Then let them approach at their own rate if they feel like it. If they don’t feel like approaching, then just admire them from a distance. For little dogs you can squat down to their level. But be careful to do so from far away and face sideways so that when you are shorter your face isn’t right in their face. Although you’ve probably heard that you should greet dogs by letting them sniff your hand, reaching out to their face is actually pretty rude, especially if you’re facing them or staring. Imagine if someone was standing near you and they reached a hand out towards you suddenly and unexpectedly invading your space. It’s best to let the dog approach at his own rate and avoid putting pressure on him by reaching out. Some kids have phobias about clowns or certain types of people. Similarly some dogs are afraid of some types of people or people wearing or carrying certain objects or in various environments. Even if you’ve followed all of the appropriate greeting rules so far, some pets may still feel uncomfortable. So if you see signs of fear, discomfort or tension, even if the dog comes up to sniff you, avoid petting him. Instead just admire the pet from nearby. Lastly, remember that some interactions are just not appropriate or aren’t as fun for the animal (or for children) as you think. For instance, most kids don’t like being pinched on the cheek even if they will put up with it. Similarly most dogs dislike being hugged even by family members even if they allow it. Imagine how a dog who dislikes hugging might react if they are hugged by someone with whom they’re only mildly familiar. When interacting with a dog, especially an unfamiliar one, avoid hugging, patting or petting in an overly familiar way. Instead pet in a calm, gentle, relaxed manner. While many humans routinely greet dogs inappropriately and many dogs put up with this socially inappropriate behavior, if you stop and think about it, correct greetings are common sense. We should be respectful of dogs instead of assuming they should be friendly and polite even when we humans are not. Question: Have you ever been bitten because you’ve greeted or approached a dog incorrectly? Remember, dog bite prevention starts with YOU! It is within your power to prevent dog bite incidents from happening to your child. It’s called “parenting” try it some time! Hello everyone! I hope that the weather where you are is warm and conducive to lots of outdoor play for you and your dog. Spring and summer are great seasons aren’t they? You get a chance to get out more, take walks see the sights, get some fresh air, perfect really! Spring and summer ( and most of the fall) bring out the dog owners and their pets. At this time of year we see dogs everywhere don’t we? But dog owners aren’t the only ones taking advantage of the great weather, we also see a lot more parents out with children. It is those parents that I wish to address today. Most of you (in my experience) will allow your children to run right up to a strange animal they meet on the street. You see nothing wrong with allowing junior to boisterously approach a leashed animal being walked by it’s owner. Problem with that is, it IS the WRONG way to approach an animal you have never met. You are teaching your child to become a bite statistic by condoning this behavior. You are also teaching them the wrong way to deal with dogs. If you can’t teach your children to properly approach a dog on the street chances are that at some point in time your child will be bitten either by a strangers dog on the street or by your family dog in your own home. You are setting your own trap. Just for a second put yourself in the position of the dog. It’s hot outside, you are just trying to find some shade and lay down and enjoy the sun when suddenly a small human plants himself square in the middle of your back and begins to bounce up and down. You look to the bigger humans, the ones who call themselves your “owner” with pleading eyes. “Please” those eyes say “can you take your offspring off my back? I am very hot and tired and I don’t like this game.” You might even let out a little growl of warning, but much to your surprise all your humans do is laugh and encourage the small human’s behavior. You are a good dog so you try to ignore the small human’s behavior, but he then begins to pull on your tail and ears. Suddenly you have had enough! Your humans won’t make the annoying behavior stop. You are a dog so you can’t speak up to say “stop that” so you do the only thing you can, you snap at the small torturer jumping up and down on your back. Suddenly everyone is angry with YOU because you bit someone! The above scenario is VERY easy to avoid. So why do so many parents fail to avoid it? The answer is very simple. People seem to think that the family dog should put up with any sort of abuse from the children. As a matter of fact most people don’t see their children’s rough behavior with animals as abusive. They make the excuse that junior is just being a child and doesn’t know any better! That is where their excuse falls apart. Of course your child doesn’t know any better, it is YOUR job as a parent to teach him! Your child isn’t going to magically discover that animals should not be handled roughly, you have to teach them, the same way you teach them that they can not hit people or that standing on a balcony rail is a really bad idea. It is not your dog’s job to “tolerate” juniors antics, it is YOUR job to correct junior and teach him the right way to interact with animals. It is within your power to prevent dog bite incidents from happening to your child. It’s called “parenting” try it some time! Good morning all! I hope everyone is having a great day so far. Have you ever had one of those mornings where you spring from bed knowing something isn’t right? I had one this morning. You see every morning my wonderful hubby gets up at the crack of dawn (because that is when the alarm clock dogs tell him to get up) he makes a pot of coffee and takes the dogs out for their run. Simple and efficient right? Usually, and even this morning that part went just fine, until my husband forgot to lock the back door that is. The lock set on our back door has this type of handle: As you can see it is one of the type that you pull down on instead of twist to open the door. It makes opening the back door so easy it’s child’s play. We learned a few months ago that our Dane cross Phoenix has no trouble opening the door with a flick of his giant paw, so we began making sure to lock the door after bringing the dogs in. Well hubby gapped this morning and forgot to turn the lock on the back door before leaving me sleeping blissfully upstairs and heading off to work. A couple hours later I was awakened by Phoenix’ incessant barking. “Be quiet!” I hollered at him rubbing the sleep out of my eyes. Turning to look at the clock I realized that it was after nine. My hubby had been at work for an hour already, so why was I hearing my dog barking in the yard. I jumped out of bed so quickly I almost landed flat on my face when the blankets wrapped themselves around my legs. I tore down the stairs to find my back door wide open, and two out of three of my large breed dogs standing by the fence barking at the high school kids heading to school for second period. Now those of you who have known me for any length of time probably already know that we take dog ownership very responsibly. We are not the kind of people who let our dogs out and walk away, if they are out we are out. As a result none of the neighbors have ever complained about our dogs incessant barking, and have never found them running at large. That is the way we like it. However this morning hubby forgot to lock the door, it didn’t take long for Phoenix to figure this out, he is after all a very intelligent dog. Door open Phoenix and Mysty took the opportunity to explore the backyard free of supervision. For the most part they just ran around and played, and then…the high school students began heading for school. Now Phoenix doesn’t have a lot of issues, but baseball caps (especially worn backwards) for some reason make him very reactive. What do most high school boys wear on their heads these days? Yep! Basbeball caps! Phoenix began to bark, and bark, and bark, until he woke me up. Now all of this may seem rather silly to most of you, big whoop the dogs got out in their own yard and made a little noise right? No big deal! Except when you realize that while most of our fences are six feet tall the ones closest to the road are only four feet high. Supervised the dogs would never dream of jumping the fences, unsupervised I wasn’t so sure, hence the panic! Luckily I made it into the backyrad before anyone got the bright idea to go over the fence! (Did I mention that the fencing panels for replacing the low section of fence are waiting to be put up?) Possible catastrophe averted I headed back inside for a VERY strong cup of coffee. Trust me, I remembered to lock the back door on my way in. Now every time I pass the dog den Phoenix looks at me as if to say “aw Mom you spoiled our fun!” Mental note to self: change the door handle on the back door to the traditional twist type at least Phoenix Houdini hasn’t figured out how to open those yet! Were you a part of Charlie’s rescue? If so we really need to talk to you! Here in this forum we mostly discuss animals (predominantly dogs) and their welfare. By now any of you that read me with any sort of regularity are well aware of my stand on animal rights. I write about what I see what I hear and what is brought to my attention. Sometimes my views cause argument and sometimes I get hate mail. I’m tough I can handle it. Every once in a while something I write spurs someone to contact me about a problem or concern. Truth be told that is why I write. I don’t claim to get everything right, I am human, I make mistakes, but for the most part I research everything before writing and count on some pretty reliable sources for my information. When someone does contact me about an article I have written I speak to them, I hear their side and sometimes I change my mind, of course sometimes that contact just reinforces my opinion. Such was the case today when I received a phone call from a woman in Ontario who had adopted a dog from Noble Dog Rescue, Oshawa, Ontario. You will be able to read her story in the next few days I have asked her and her husband to tell it in their own words and as soon as I receive it I will share it with you. Suffice it to say that NDR’s modus operandi has caused this family’s life to be turned upside down! Right now all I can do is ask that anyone reading this post who has had dealings with Noble Dog Rescue in Oshawa contact me. I don’t care if you had a wonderful experience or if like my reader you have landed in the middle of a nightmare, I just want to talk to you about your experience with NDR. Fair’s fair, and I want to hear both sides. Although I do have a personal opinion, I am not going to share it with you just yet. The people I really want to talk to are the California rescues who put Charlie and other dogs like him on a transport headed for Oshawa and NDR. I NEED to talk to them, Charlie’s progress depends on it! You see, despite my readers numerous attempts to obtain Charlie’s paperwork and proof of vaccination from NDR, they still have not received the paperwork. Charlie’s new Mom is a dog groomer who works out of her home. Without proof of his vaccinations she is forced to crate Charlie when clients bring their dogs for grooming, and can not let him interact with the families other pets for fear he may be carrying a disease such as Kennel cough. This isn’t fair to Charlie and severely hampers his ability to bond with his new pack. If you were part of the massive transport of some 40 dogs from California to NDR in Oshawa in Oct./Nov. 2013 we REALLY need to talk to you, for Charlie’s sake. My reader will tell you the full story soon, but for now please help us to find the people who sent Charlie here from California so we can find his paperwork and allow him to bond with his family. Do you recognize “Charlie” were you a part of the transport he came in on? If so please contact us! Help Your Dog Beat the Heat! It’s really starting to get hot in Ontario this week, hot enough to turn my wiener into a ball park frankfurter, and alter his already skewed perception of acceptable behavior! I’m worried that everyone south of Barrie, Ontario is bursting into flames as I type. I am also worried that many Ontarians don’t seem to understand how important it is for your dog to stay cool in the hot summer weather. Therefore today I thought we would talk about ways to keep Fido cool this summer. Yoda does not do well in the heat. I think his temperature regulator needs an overhaul. He heats up fast, and then of course his mood changes to that of a cranky old man who hates the world! He growls, he snaps, he is just generally unhappy with the temperature, and life. When it’s hot out and Yoda has no air conditioning, he’s one of those dogs your Mother warned you about! You know the type, you go near them and they go off like a firecracker! Well since an explosive Ambassador would not be helpful to our cause, we have been researching ways to keep dogs cool in the hot summer sun. It’s a collar you fill with ice! More information on the Kool Collar can be found at their website. We found this product great for the larger breeds but a little heavy for the smaller breed dogs to carry around. For more information on the Swamp Cooler jacket check out their website. We found the Swamp Cooler jacket to be the better solution for small breed dogs, but it would work well for ANY size dog! Keep your dog busy and cool for hours with this hunk o’ ice and toys. Perfect for shelter dogs in outdoor kennels. For more information on the Kool Dogz Ice Treat Maker check out their website.You can also make one with stuff found around the house. Learn how from Animal Farm Foundation here. I soooo can’t wait to try this one, my dogs LOVE chasing icecubes so it should get an interesting reaction! This is one we are all familiar with. Just fill it up with water, and you are good to go! Available at hardware stores and department stores everywhere. Inexpensive (although depending on your dog’s enthusiasm you might go through a couple in a summer!) and easy to maintain. Just remember that you should NEVER let your dog play around or in water unsupervised! So those are my suggestions for ways to help your dog beat the heat, what do YOU do to keep Fido cool? YOUR dog is YOUR responsibility! Ever wonder when it’s ok to let your dog off leash? 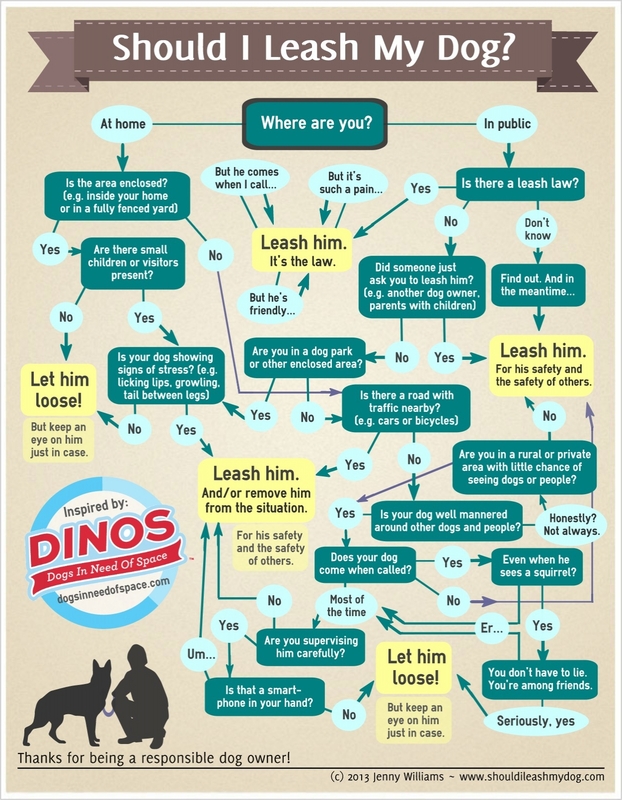 Check out this handy flowchart created by the fabulous Jenny Williams. In just a few text bubbles (and with a sense of humor) it’ll help you make a responsible, respectful, safe choice! Download and print the pdf to share! Note: this is not available for commercial use. Jenny Williams gets all the props for this one. Please be sure to give her credit and check out her site: ShouldILeashMyDog.com for more! Million Mutt March Against BSL Brings out More Support than Ever! This past weekend in several cities around the world dog owners, dog lovers and their dogs came out in force to show their support for a repeal of Breed Specific legislation. They called it the million mutt march, and I wish I could have been there to see it myself. In 2005 when we started this fight getting people to come out and support our dogs was like pulling teeth. Don’t get me wrong we drew dedicated people, there just weren’t many of them and we had a hard time getting the message through. Then we began speaking to owners of other breeds. We told them how THEIR dog was just one stroke of legislation away from being added to the banned breed list. We told them that while BSL exists in any form it is dangerous to ALL breeds of dog. Lo and behold they began to understand, and with each subsequent rally we saw more people and their non pit bull dogs come out to take up the fight. Then this past weekend images of the march started coming out of Washington DC, and I realized we had been heard! Hundreds of dog owners marched on Washington DC to raise their voices for change. No longer would we struggle to get people to rally together for these dogs. They had heard us and they were on board for change. For many of you who are still somehow oblivious to this fight let me explain. Breed Specific Legislation (BSL) is the act of restricting a dog due to it’s breed. BSL is the reason our pit bulls and anything that even slightly resembles a pit bull in the myopic eyes of the law must be muzzled in public. This restriction is not optional, it is the law even if your pooch is the most mild mannered of dogs. In the eyes of many world governments he/she is not a dog but a lethal weapon in the eyes of the law. Now I am sure that was not news to many of you, but for those of you just learning what BSL really is, how do you feel now? How do you feel about genocide of an entire subset of the dog population? How do you feel about owners of these dogs being treated like criminals for their choice of breed? How do you feel about such a sentence being passed on a dog who has done nothing wrong, who’s only misfortune is to have been born resembling a pit bull? BREAKING NEWS: The government has ordered that all blue eyed humans be rounded up and euthanized. Last evening two blue eyed humans broke into the Prime Ministers residence and roughed up his staff. The Prime Minister has declared that all blue eyed humans are a danger to society. Therefore they will be rounded up and incarcerated until such a time as they can be disposed of humanely. Sounds crazy doesn’t it? Yet that is exactly how this went down! Here in Ontario a child was bitten by a pit bull and within weeks pit bulls and anything falling into the government’s broad definition of pit bull became hunted outlaws. That was 2005, and we have been fighting for these dogs ever since! It is sad really to know that our governments value animal life so little that the answer is to eradicate the world of pit bulls, or any other animal they deem unworthy. The human race has a talent for destroying that which they do not understand or are afraid of. To any of you who have read the above and still don’t think BSL affects you, think again. I was naive that way myself that is until MY innocent Lab/Husky cross got caught up in Ontario’s BSL. Her story is here. Truth be told folks, NO short haired blocky headed mixed breed dog is safe! Don’t fall for the media hype, get to know a pit bull, it won’t take you long to see what we are fighting for, and maybe next time you will feel inclined to join in and raise your voice for those who can’t!